At least 80% of older Americans live with at least 1 chronic condition. 50% live with at least 2 chronic conditions. Silver BookAt least 80% of older Americans live with at least 1 chronic condition. 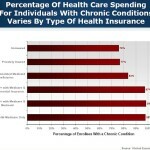 50% live with at least 2 chronic conditions.